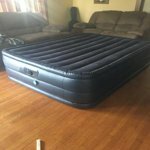 The Raised Downy Airbed is engineered with dual chamber construction: the lower chamber functions as the box spring form on a traditional bed, providing extra firmness and support while the upper chamber functions as a mattress. 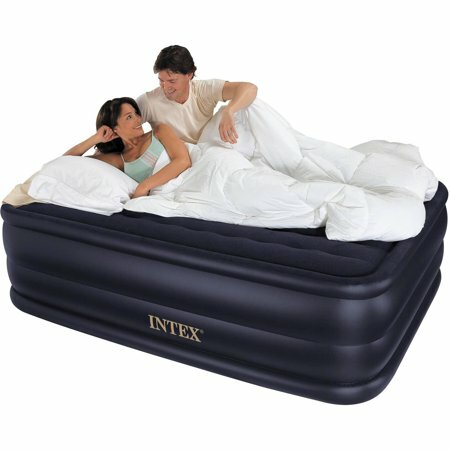 It provides the convenience of a portable airbed with the comfort of sleeping on a raised platform. Plush, waterproof flocking covers the mattress top for a luxurious feel to provide a cozy night's sleep. In addition, the Pillow Rest is remarkably easy to inflate with the built-in, high-powered electric pump; quickly and easily inflate both chambers with the touch of a switch. Then adjust to any level of firmness for the ultimate in comfort. 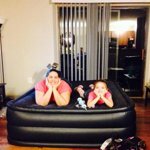 The airbed inflates in about 4-3/4 minutes and deflates completely for travel and storage. Should the mattress feel a little too soft or firm, you can customize the comfort level with the touch of a button. An indentation on the side helps grip fitted sheets so you can feel comfortable in the bedspread you already have. Regarding Inflation: When you first inflate your airbed, the material will stretch which is sometimes misinterpreted as leaking. You will sense a loss of pressure, that's just the bed stretching. Simply re-inflate the bed again. Do so as needed until the bed fully settles, usually in 2-3 nights. We bought one 6 months ago from another store with continuous use it lasted until a seam popped then another. Probably from to much jumping on it..however it never lost air..just became too difficult to sleep on with the bulge. This time we got the 2 year warranty. The comfort for the price cant be beat. 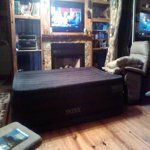 Best Airbed I've ever owned!! This bed is awesome!! I was very impressed with the firmness. I've never had an air bed that didn't lose air and feel all wobbly while trying to sleep on it. It was easy to set up as well as take down with the built in inflator. And the storage bag is perfect for storing when not in use. Overall I am very happy with this product and so is my friend that sleeps on it when in town. This is the best deal for when company pops in for a visit. The bed inflates quickly and our guest report sleeping very well. I like the built in pump, when new it will expand (stretch a little ) and it is easy to flip the switch to the pump to add air. We had regular air mattress which would go flat over night and we would have to drag out the shop vac to refill it; well those days are gone. This comes with and carrying bag for tidy storage and a patch kit. Took just a couple minutes to air up and it is very comfortable. Perfect for our camping trips and we don't wake up on the ground. Deflates quickly and easily and goes back in the complimentary bag. Thank you for posting your review. We are happy to hear you are enjoying your airbed.